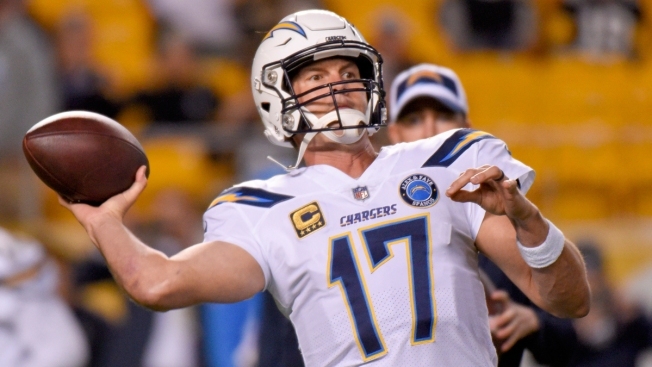 Los Angeles Chargers quarterback Philip Rivers (17) warms up before an NFL football game against the Pittsburgh Steelers, Sunday, Dec. 2, 2018, in Pittsburgh. Badgley initially missed a 39-yard kick but Pittsburgh was called for offsides. Badgley's ensuing 34-yard attempt was blocked, but the Steelers were again flagged for jumping across the line of scrimmage before the snap. He drilled his third attempt at the game-winner, and the Chargers gleefully declined another Pittsburgh penalty while they poured onto the field in celebration. Roethlisberger publicly tweaked Brown following a loss to Denver last week, though the star wide receiver stressed he knew it was nothing personal. It certainly didn't seem to have an impact on their play. Roethlisberger hit Brown for a 9-yard gain on Pittsburgh's second play from scrimmage and again for 46 yards on the following snap, a strike that set up the first of Conner's two 1-yard touchdown runs in the opening quarter. A beautiful 28-yard dart from Roethlisberger to Brown pushed Pittsburgh's lead to 23-7 at the break but Los Angeles ripped off the next 23 points thanks to a bit of luck some dynamic playmaking. Allen caught a 10-yard touchdown pass from Rivers late in the third quarter on a play in which Pittsburgh defensive backs Sean Davis and Joe Haden collided going for the ball, which popped up in the air and landed in squarely in Allen's hands. Los Angeles — which managed just two yards rushing in the first half with Austin Ekeler filling in for Gordon — then turned to Jackson. The rookie seventh-round pick used his quickness to squirt through Pittsburgh's defensive line, and his 18-yard burst up the middle gave the Chargers a 30-23 lead. Steelers: Travel to Oakland to play the Raiders next Sunday. Pittsburgh hasn't won in Oakland since 1995.